The great room has a wood-paneled tray ceiling and a cupola above. Nearly every room faces the water (Photo: Dan Cutrona). Partial-height screens transformed this basement into a space reminiscent of East Asia. Four architects present their approaches for designing stairs to deliver spatial drama, transition, and procession. This newly built Minneapolis residence looks right at home in the diverse mix of older Tudor, Craftsman cottages and newer styles of homes in the area. The ankle windows on this project is an example of a good detail solving a problem. Storage ideas from minimalist cabinetry, to pantries under stairs, and drawers below a pet spa. 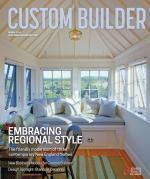 Imaginatively designed baths contribute star power to a custom home. Check out these projects for design inspiration. This residence in Scottsdale, Ariz., is BALA’s Home of the Year for 2015. The owners wanted a Spanish-style design, but with an updated, neutral color palette.